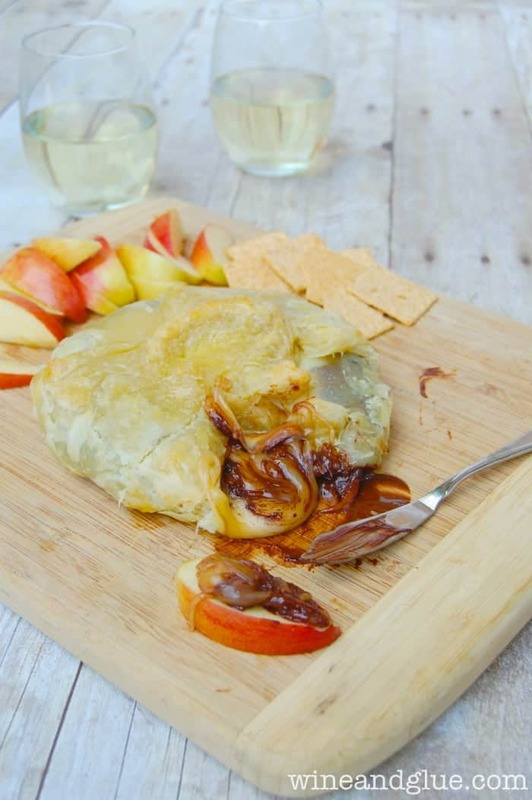 The perfect combination of sweet and savory with Baked Gouda and Dark Chocolate baked inside a Puff Pastry. I realize that in talking about my amazing Cheesecation (both Part 1 and Part 2 of my Wisconsin Cheese Tour), I talked a lot about the wonderful people that I met on my Cheesecation, but I haven’t really talked about the people that I went on the Cheesecation with! They were seriously some of the nicest people you could meet. There was April from Food N Focus, Molly from Peanut Butter & Dill Pickles, Nick from Dude Foods, Jen and Joe from Edible Milwaukee, Sarah from Milwaukee Kitchen, and Ellie from Taste of Home to name just a few. It could not have been more fun hanging out with them and eating with all of them. Not to mention the several bottles of wine we shared Friday night. Also along on the Cheesecation were Lori and Paul of Burp!. They were the amazing duo who pulled together all the bloggers. Husband and wife, long time Milwaukeeans, and super fun foodies, they were great to hang out with and get the inside scoop on all things Milwaukee food. I’ve been following them now on Twitter and Instagram, and I actually blame them for this recipe. They are credited with the super inspiration behind this awesome delciousness, because they have been posting tons of pictures different cheese and chocolate pairings. It sort of made me obsessed with this idea. 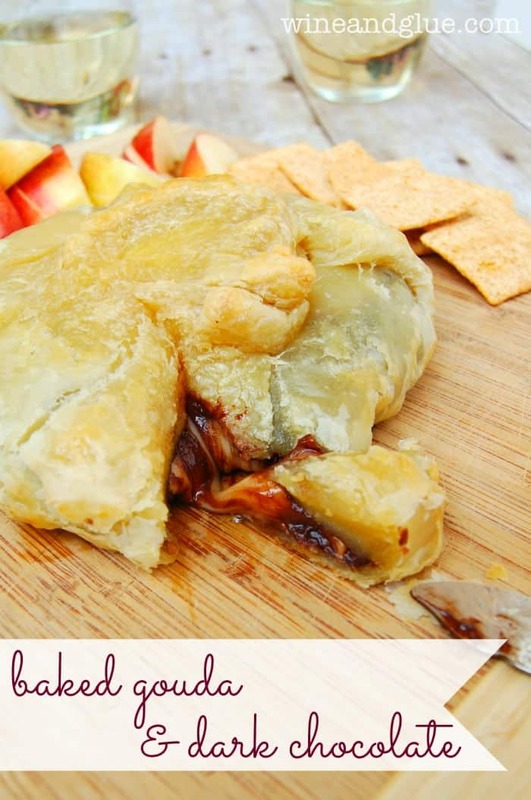 So I grabbed a great Wisconsin cheese, some May Bud Gouda, and paired it with a really dark chocolate, all baked inside a puff pastry. I will freely admit that I didn’t really know what I was doing here (I’ve told you time and again I’m a wannabe, people) and I was a little nervous . . . but the results were awesome. The chocolate and the gouda mixed together just perfectly! It was delicious on cheese and crackers . . . or you know, right off the knife. It bakes up so pretty, and I’m definitely dreaming of a day when I have enough time to host a fancy cocktail party that doesn’t include my children running through the legs of my fancy guests with their pants off. Spread the puff pastry on a silicon mat or parchment paper lined baking sheet. Break up the chocolate into half inch sized pieces and put it in the middle of the puff pastry. Set the gouda on top and then fold the edges of the puff pastry up over the cheese and pinch together. You can get fancy and try to make a design, I made a heart (#fail), just make sure it’s all pinched together. Brush the puff pastry with the beaten egg. You won’t use all of it, but it gives it a nice shiny finish. Bake for 20 minutes or until the puff pastry is nice and golden. 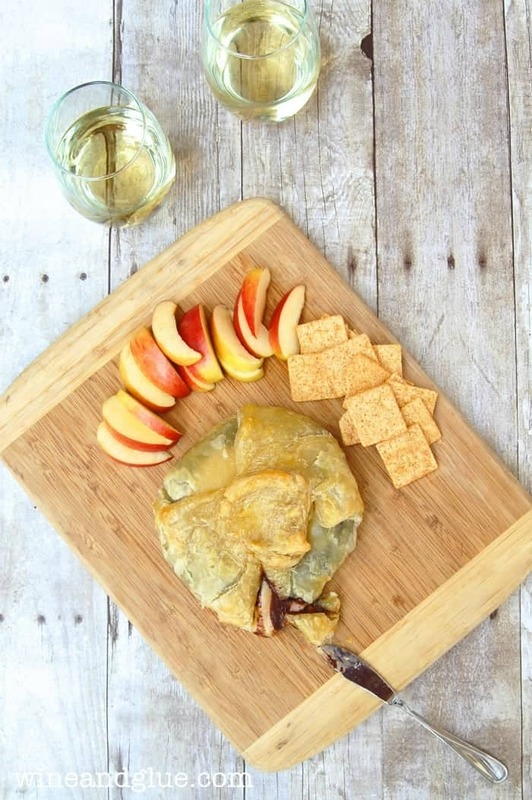 Serve immediately with crackers and cut up fruit. 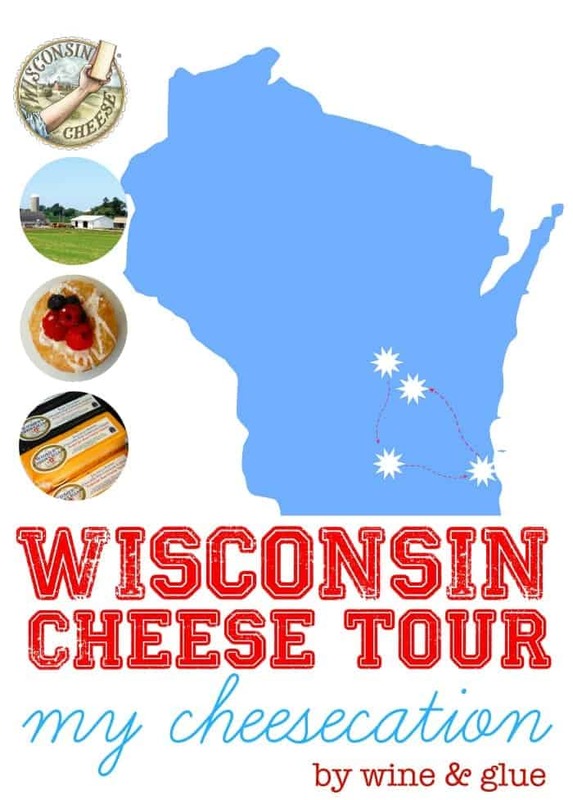 While we are talking delicious cheese from Wisconsin, make sure you check out Part 2 of my Wisconsin Cheese Tour! Looks and sounds amazing! What wine did you pair with it? OMG. OMG. OMG. Chocolate and cheese. I love you. Yes! When you posted the other day about loving cheese and chocolate, I almost responded (in a very self promoting way) well then stay tuned for tomorrow!! Oh wow, Lisa, this sounds amazing! It’s the kind of thing I wouldn’t think of on my own, but as soon as I saw the words chocolate and gouda, I was hungry. Fantastic idea! That looks heavenly, Lisa! Cheese and chocolate? Yes please! Oh my goodness! This sounds SO good! I never think to pair chocolate and cheese together. This needs to happen in my kitchen. Yum!! Can this be assembled ahead of time and baked a couple of days later? I wouldn’t do that personally, Sue. I would worry about the puff pastry getting funky, and honestly it’s super quick to assemble!